The first 3 words represent our nation’s activism in the 1970’s that awakened a conscious desire to improve our respect for our environment and our Mother Earth. 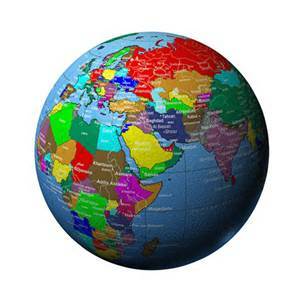 United under shared values to protect our planet, it was estimated that over 20 million people came together during the first celebration of Earth Day on April 22, 1970. The 4th word, Recirculate, exemplifies our continued drive to be as environmentally-friendly in our industry, as possible, with state-of-the-art Recirculating Systems that enable the ability to reduce and reuse and eliminate product waste. 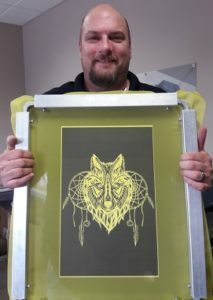 Greening-up a screen printing business simply makes good business sense – for owners, employees and our planet. Within that vein, we offer screen cleaning systems to accommodate screen printing shops from home-based and store-front companies to large scale commercial operations in their efforts to be environmentally responsible. We recognize, too, that the bottom-line of a business is also prominent. 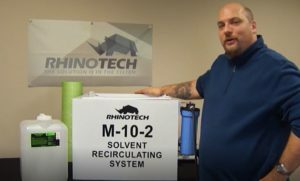 In response to that bottom-line accountability and respect for the safeguards and policy laws enacted by city, county, Parrish, state and Federal entities, RhinoTech showcases the M-10-2 Recirculating System. This particular Recirculating System maximizes economy of the screen cleaning function. It embraces an intelligent way to clean and reuse screen cleaning products. Additionally, the M-10-2, like all of our other Recirculating Systems, fits securely under a washout booth that is a bonus when floor space is at a premium. The M-10-2 operates with an air-operated trigger action, flow-through brush, 2 GPM with flow tray and comes with filtration media. To help reduce and reuse screen cleaning chemical, it is held in a 17-gallon tank to offer incredible cost savings (you can also clean flood bars and squeegees). This system will reduce and reuse chemical waste along with the annual costs of re-supplying screen wash. Energy consumption is reduced due to an air pressure system of 30-40-PSI. Annual out-lay based on this recirculating method is evidenced in bottom-line savings for the company. Lastly, the M-10-2 will help to pro-actively green-up a business and honor our Mother Earth. 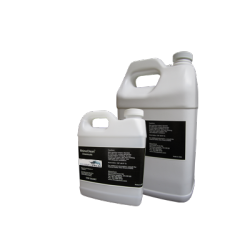 Low Odor screen wash designed to work quickly on Plastisol Ink. Ideal for efficient and expedient screen washing after the press run. Has a very high flash point, over 425 F.
Biodegradable, non-toxic and environmentally friendly. Meets the VOC regulations, rule 1171. Need a consult on how to incorporate a Recirculating System into your business? Have product and equipment questions? Let’s talk. Prep a Screen Frame. Doesn’t have to be a big deal when you follow the steps toward the ultimate goal of getting a seriously strong bond of screen mesh to frame. Though nice and shiny, we already know that an aluminum screen frame that hasn’t been sandblasted won’t be workable when in the stretching mesh phase. And, yes, even if you’ve just used a grinding disc and/or sandpaper to prep the surface, though appreciated, our experience has demonstrated that the frame still won’t be rough enough for the glue to really “bite” into the frame. By watching the video and following a few straight-forward steps, your screen prep will be quick and efficient. With the glue bottle tip, apply a thin bead of RhinoBond Instant Adhesive around the entire surface of the frame (you can do this using RhinoMite 2-part adhesive, as well). Be sure to only use a small amount. If you lay too much glue down, it’ll smear and drip down the sides of the frame (it won’t hurt anything; just won’t look good). Next, using the little yellow applicator, spread the glue evenly around the frame. Remember, you’re just pre-coating it. Once the glue is spread out, use RBA 1500A Aerosol Activator to give it a light, quick mist to cure. DON’T OVER SPRAY. Too much will over-cure the glue. This could make it crack, so that when you’re ready to stretch the mesh, the glue could potentially release making it impossible to achieve a secure bond of mesh to frame. And, that’s it! Congratulations. Your frame has just been prepped for an ideal glue to glue, mesh to frame stretching situation. We really appreciate you watching our videos. M-10-2 Recirculating System is a Must-Have for Screen Printers Everywhere. Replace the bottle and the brush with the M-10-2 Recirculating System! 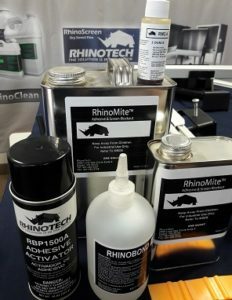 Inject a whole new way to clean screen frames while saving on screen cleaning products with a highly affordable and over-producing screen wash from the RhinoTech family of screen cleaning products. In this video, Chris offers a step-by-step method in which to use this closed-loop system to recycle screen wash, in this case, SW 197, with a space-saving Recirculating System. It stores easily under a washout booth. All in all, it makes the tedious job of washing screens a bit easier and quicker and not so tedious. Hook up air to the air pump. Turn system on with brush trigger start. The liquid will flow through the scrub brush as you wash the screen frame and stream down the washout booth drain into the M-10-2. The liquid will first hit the top filter paper that sits on top of a perforated plastic basket. It will then settle into the chamber 1 and overflow into chamber 2 to catch debris and then flow back into the pump. The pump will pump liquid into the canister filter for added filtration and back into the unit to reuse. Use Screen Wash 197 with Plastisol and U.V. ink to bolster your screen cleaning with the M-10-2 Recirculating System. Thanks for watching. And, for considering an economical and Mother Earth-friendly way of dealing even more responsibly with your screen cleaning liquid. 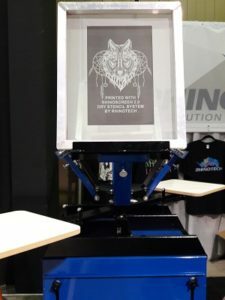 It was a great event that showcased the RhinoTech 5′ Conveyor Dryer and Textile Printer Combo teamed with an extraordinary stencil-making system with heat press. This system is a beauty of a space saver when working in a confined studio or home-based environment. Combo dryer/screen printing press with screen frame created with RhinoScreen™ 2.0 Dry Stencil Film. This 5 Ft. Convyor Dryer/4 Color 2 Station Printer offers affordable, flawless, professional and consistent functioning. It features one, 2,000 watt heating element. 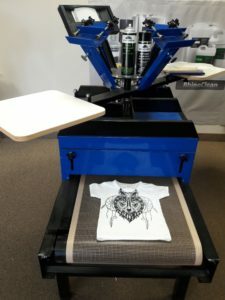 The flow-through design offers simple garment loading and the attached, manual screen printer is wholly unique and efficient. The space saving design is a great solution for shops with limited floor space. Decision time? All steel construction with powder coated finish and made in U.S.A! 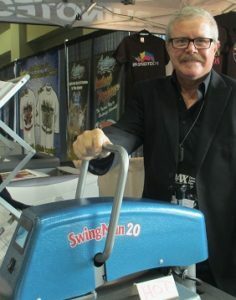 The RTDK 16 x 20 swing- away garnered rave reviews! 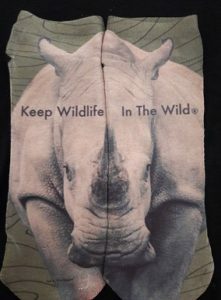 Once you’ve printed an image onto RhinoScreen™ 2.0, just heat press onto screen frame. No film positive, capillary film, emulsion, exposure or drying time necessary – ever. This product amps up stencil-making. 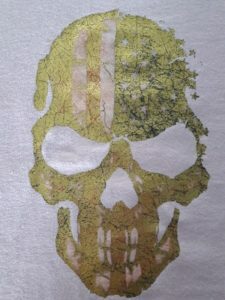 From traditional stencil-making with many steps, this dry stencil film process involves just two. This film also responds to needs for safer and environmentally sensitive products in our industry. The paper is recyclable as it contains no silicone. • Money and time saved. • Reduced inventory space needs. • Affordability that improves the bottom-line. For the BEST results, we also recommend using an OKI Data laser printer. Ink Removal, On-Press, in a Flash. INK REMOVAL. On-Press. Not something we generally like to do, but a necessary step when a color change or ink smear has to be corrected. Here’s the 411 on how-to finesse the ink off the screen frame for an on-press ink change and a demo on the easiest way to remove ink from the screen at the conclusion of printing. Start with PWG122 Press Wash that has been designed to rapidly flash off the screen so that you can quickly and easily make an ON-PRESS ink change. Next, lift the printer arm holding the screen frame that you want to make the color change on so that you are looking at the underside of the screen frame. Using a paper or cloth towel, squirt some press wash onto the cloth. Working from the underside of the screen, wipe the targeted spot until ink is removed. Then, lift the screen and if it still seems to need a little more work, use cloth to carefully finish wiping from the squeegee side. Before you start to print, spray the platen with RBA2, an Aerosol Adhesive Spray Mist to help ensure that the t-shirt will remain stable on the platen. For fleece and heavier fabrics, a good choice is RBA3 Adhesive Web. Now, flood the screen and continue printing. Once you’ve completed printing the project, card off the ink and head to the washout booth to clean the ink off the screen. The next part of the video will take place at the RhinoCleanWashout Booth for an Ink Removal demo using SWG14C-citrus-scented Screen Wash.
Squirt the screen wash onto the screen and begin scrubbing. Scrub on both sides. Very quickly, the ink will begin to emulsify. Ink Removal from the screen. With a pressure washer, like the amazing RS1500A, rinse the screen on both sides. To get rid of any residue, apply a bit more SWG145C, scrub and rinse. If you prefer a soy-based product, choose SWG305. The manual, textile printer used in the demo is a SureCure 5-4/2 combo Conveyor Dryer/Textile Screen Printer from RhinoTech with a 110V. The RhinoClean Washout Booth is made of Polypro with an aluminum stand. Soy-based, SWG305 Screen Wash and SWG145C are excellent options for the final screen wash.
On-Press Wash: PWG122. And, PWG125 is a multi-purpose Press Wash that will also work on card stock, U.V. and Plastisol inks. Stay tuned for the next in the series that is How-To REMOVE A STENCIL. Free Shipping opportunities are available with purchase of $50 and over when delivered in the contiguous U.S.A. And, we ship world-wide. Blockout a Screen Frame with a Great Technique. 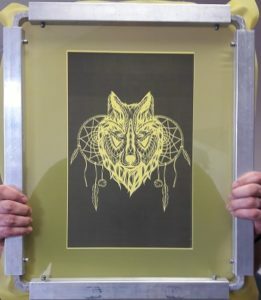 Blockout a Screen Frame and you’ve mastered an essential part of screen printing. 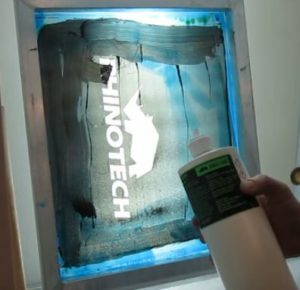 This is Part 3 in this RhinoTech series following Coating a Screen and Exposing and Developing a Screen Frame. To Blockout a screen, the necessary tools include the screen frame that we previously exposed and developed, RB203 that is a thick product and water-soluble. It is a perfect choice to use on coarser mesh counts. For finer mesh counts, the choice is RB202 that is a thinner product. And, for an absolutely permanent blockout, the choice is RB201. As a side note, we used the BL1620 Exposure Unit w/backlight. Puddle blockout in the corner of the frame. With the trusty yellow squeegee, spread the product around the edge of the frame. This is important to ensure that all pinholes from dust are covered. NOTE: RB203 is water-soluble making it easy to wash off the screen. And, the backlight on the Exposure System makes it easy to see where light is potentially seeping through, so you can cover those areas/spots, easily. Work carefully, though, to make sure that you don’t get any of the blockout on the image. When the screen is dry, use regular packing tape to tape out around the inside edge of the backside (squeegee side) of the frame. This will ensure that when you print, no ink will get squished between the mesh and the frame. As always, thanks for taking the time to view this demo. 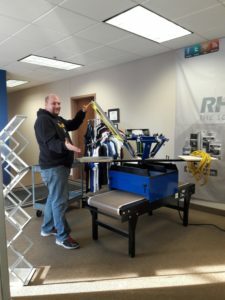 If you have questions, please contact us directly at 651-686-5027 x 4 or info@rhinotechinc.com. Free Shipping opportunities are available with on-line purchases of $50 or more when delivered in the contiguous U.S.A.
Exposing and Developing a Screen Frame is a vital part of the screen printing process. In this step-by-step instructional video (that follows Part 1 – Coating Screens 101A), you’ll be energized with the tips and technique to simply achieve this necessary step. 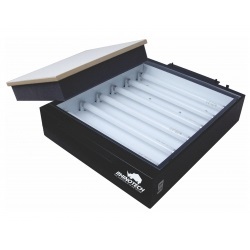 To begin with, note that we are using a BL1620 Exposure Unit with UV Black lights. It has a simple on/off switch that, in combination with using the timer application on your phone, will enable you to perfect how to expose and develop a screen frame with finesse. Exposing and developing a screen frame begins with an Exposure system. The first step is to have your artwork ready. We printed our artwork onto RhinoJet Film PositiveMaterial using an Epson 1430 inkjet printer. We used this water-proof clear film material, because it offers a very dense film positive helping to ensure that no light will penetrate the blacked out area. Next, position the film positive material onto the Exposure System. Then, position the coated screen frame over the film positive (see Coating Screens – 101A). Add a pressure plate to ensure good contact. We use one that is made of melamine board with foam (foam side down) to ensure that the film is tight against the screen. And, as you can see in the video, we topped it with a few gallons of RhinoMite Screen Frame Adhesive to secure it even more so. We know that it will take a 4-minute exposure, because of previous test results. So…always test with a film positive that has been pre-made for you using different filters. This will help you narrow down variables due to type of Exposure System and type of emulsion you’re using. Once the screen is exposed, retrieve the screen frame and get ready to begin the Developing Process. The first step in the DEVELOPING process is to move to the RhinoClean Washout Booth. Place screen in the booth and wet screen on both sides. Next, set Pressure Washer to wide fan with low pressure (easily done with the RS 1500A) and with a smooth motion, continue to wash frame – notice we’re working on the non-squeegee side of frame. Be sure to flip frame and continue washing the other side. And, that’s it and that simple. Now, let the screen dry before you begin to block out the frame. And, because there are a few ways to do that, please watch the next video, Part 3 in the series, Blocking out a Screen Frame – 101A. Thanks for watching our video tutorials. 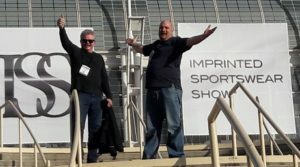 The RhinoTech Team appreciates your interst and looks forward to helping you be wildly successful or even more so. Free Shipping opportunities are available with on-line purchases of $50 or more when delivered in the contiguous U.S.A. And, we ship world-wide. Tips and Technique on How to Coat a Screen Frame – 101A. To Coat a Screen Frame takes a bit of finesse that is easily learned. This video step-by-step will show you the ropes and help you easily and quickly learn the steps to handling a scoop coater during the process of coating a screen frame. Add sensitizer to emulsion and then let stand so bubbles will disappear. 3 – Scoop Coater that has a rounded and sharp side and an angle piece that enables you to tip and rock and shear in one smooth motion. Generally, you’ll be working with this in a light safe environment. For demo purposes, Greg is working a bit more quickly so he can move to a light safe area to let the screen dry. To begin, pour emulsion into scoop coater without over-filling and then begin to coat the non-squeegee side of the screen frame. The reason that it’s important to start on the non-squeegee side of the frame is because you want to have the build-up on the bottom or non-squeegee side of the frame. Move scoop coater straight up the frame and then shear off at the top. REPEAT. Next, turn screen around and coat the squeegee side. REPEAT. Place frame in a horizontal position in a light safe drying rack to dry. Once dry, the next phase will be to expose the screen. And, that will be Part 2 in the series, EXPOSING AND DEVELOPING SCREENS 101A. Really appreciate you watching our demo on how to coat a screen frame. If you need more info and have questions, please contact us at 651-686-5027 x 4 OR info@rhinotechinc.com. We look forward to working with you. Stencil-Making in Screen Printing is so much Faster Now. Making a stencil is key in screen printing. We know that you know that. And, for all time, it’s been a time consuming process with many steps that include: creating a film positive, applying emulsion or using capillary film, exposing the screen, developing the screen and then letting the screen frame dry. 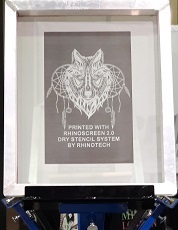 But, now, there’s a new and improved method to create a stencil with RhinoScreen™ 2.0 Dry Stencil Film. This process has literally revolutionized stencil-making. And, created a whole big crowd of happier screen printers who are liking this new, 2-step method that eliminates the need for a film positive, emulsion, capillary film, exposure and drying time. The image on the right was created with this latest system. Screen printed design w/Plastisol ink onto a black t-shirt. Placed shirt on the Conveyor Dryer. Added BLUE, Textile Metallic Foil by heat pressing on top of the design. Final result – a Tee with added dimension, a pop of color and appeal (for the customer) and a higher price point for the business owner. Screen printed Tee using new stencil-making system. Elimination of extra products and time needs. Affordability that improves the business owners profit-margins. Responds to needs for safer/enviro-sensitive products in our industry. Used paper is free of BPA and Phthalates, contain no organic pollutants, such as PFOS and PVC materials or organotin that are powerful biocides and fungicide. Used paper is recyclable as it contains no silicone. For a complete, step-by-step video of this cool system, please click HERE. For more info and to get your questions answered, please contact our Customer Service Specialist at 651-686-5027 x 4 or info@rhinotechinc.com. Let’s work together and help you be wildly successful or even more so. Screen Printing, Heat Transfer Printing & More. ? Answered. Expert Heat Transfer Printing guy. Information on Screen Printing, Heat Transfer Printing, Sublimation and more. Whether you’re new to Screen Printing, Digital Printing, Sublimation and DTG Printing or experienced in one of the many types of printing in our industry, there is something for everyone to ponder and learn from in the annual Printwear Q & A Troubleshooting Guide. Read captivating answers regarding Screen Printing, Heat Transfer Printing, Sublimation, DGT, Advertising and Business Operation questions. This feature edition of the magazine, along with popular experts in our industry, have volunteered their time and expertise in an effort to unravel the intricacies of printing specialties to help the reader be successful. RhinoTech and the Experts – Advise. RhinoTech shared the secret to getting a good bond between mesh and aluminum screen frame; the smart, effective way to apply foil to a heat transferred design. Inksoft answered the question on how to build an email marketing list without a budget. Representatives from Rhinestone World, Stahls’, Joto and a long list of other industry professionals also supplied answers to the most often asked questions. Inquiries and answers regarding Heat Transfer Printing and Sublimation were illuminating. Since sublimation is going gangbusters, the explanation on how to create artwork for all-over printed dye-sublimation shirts becomes a gateway for a new service stream and revenue builder. And, Screen Printing questions revealed the same problems that the experts had tackled and resolved at some point in their own careers. From color matching to exposure systems, a pretty vast sum of valuable information was imparted. The use of this method involves a way to apply images to to a variety of specialty coated items such as metal, ceramic, puzzle blanks, mouse pads and polyester fabric using dye sublimation ink, a (good) heat press with accurate pressure. Using dye-sub ink on 100% polyester is different, though. No coating on the fabric is required. 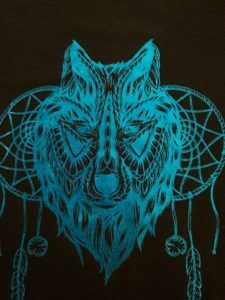 You simply screen print directly onto the fabric. The Rhino socks were printed with this method. -Print design in mirror image, so that it will end up being “right reading”. -Position t-shirt onto heat press bed and add parchment paper on top of shirt. -Next, heat press the t-shirt for 5-10 seconds with MEDIUM PRESSURE to remove wrinkles and moisture. -Remove parchment paper and position design on shirt. -Place parchment paper on top of design. -With MEDIUM PRESSURE, heat press for 25 seconds at 330° F.
– Carefully, HOT PEEL the transfer by beginning at a corner and rolling the paper back against the grain in one smooth motion. -Crinkle Foil to add richer texture then flatten it out on top of design. -Place parchment paper on top of Foil and heat press for 25 seconds at 330° F.
-Remove parchment paper and let t-shirt cool. -COLD PEEL by just rolling the foil off the shirt. -Add parchment paper onto top of design; re-press for 10 seconds to doubly ensure a foil bond. RESULT: Excellent color pop, added dimension and appeal. Screen Printing = Screen Printer/ Conveyor Dryer. A Combo. Screen Printing equipment options. Screen printer/conveyor dryer combo. Space an issue in your shop? How about a manual screenprinter and conveyory dryer option? Our 5′ Screen Printing Dryer offers affordable, flawless, professional and consistent functioning. It features one, 2,000 watt heating element. The flow-through design offers simple garment loading and the attached, manual screen printer is wholly unique and efficient. The space saving design is a great solution for shops with limited floor space. So many options. You’re bound to have more questions, so please connect with us. And, thanks for taking the time absorb all of this info. Printing for Team and Spiritwear is on! INSTANT ADHESIVE and TWO PART SCREEN FRAME ADHESIVE. IT’S WHAT YOU NEED TO KNOW.